Hard Drive activity (read or write) with current speed in a tooltip. This information is shown using separate tray icons (see screenshot). You can enable or disable features depending on what information you want to see. And highly useful for people who want to see when your hard drive is active and what is the speed to writing on your disk. A simple yet effective tool, plus it’s only 2MB in size and free with no malware (verified with VirusTotal and Web of Trust). Windows XP (32-bit and 64-bit. 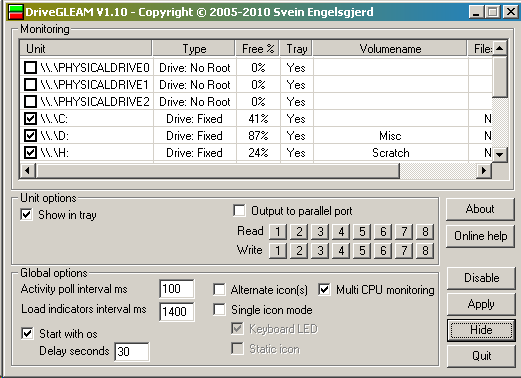 DriveGLEAM is a hard drive activity indicator and also include built in extensions for monitoring CPU and memory load. It works by imitating the harddrive LED on screen. This is a very useful if your computer case is hidden (under the table) or on another physical location (remote desktop). DriveGLEAM features independent indicators for each drive or partition and allows you to monitor both read and write access. As a option DriveGLEAM allows for external output (via the parallel port) so it will be possible to build a LED panel for monitoring your hard-drives with real physical LED’s. The difference between the build in HDD access LED on your computer case and DriveGLEAM external ones is that DriveGLEAM allows for independent colored LED’s for read or write access. 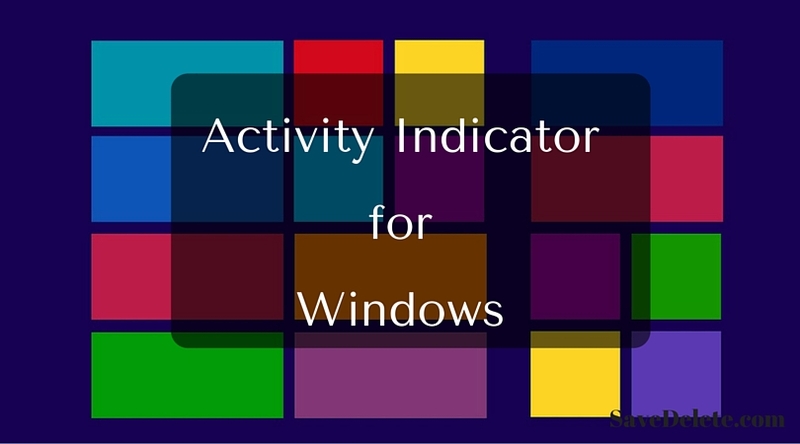 DriveGLEAM can also use your keyboard’s scroll lock LED as a activity indicator. DriveGLEAM is known as a robust and fast application. It’s also very resourcefriendly and does not require a install or other external files with the exception of inpoup32.dll (in DriveGLEAM’s directory) if you want to use external output for your indicators. DriveGLEAM does not install behind the scene drivers or ‘hook’ into your system and will thus not reduce your overall system performance. As a bonus a potential failure can corrupt your hard-drive(s) content or should not be able to halt your system. For the technical minded people DriveGLEAM is written in 100% C for maximum performance. If you have anything to add to this post, then please comment below.